There hasn't been much time over the last four years that all three of my favorite college trio have been in the United States at the same time. Now that Danielle and I live in the same city, there was no longer any reason to not road trip to see Lauren in Kentucky. Knocking another state off the list, we drove up late on a Friday, barely stopping to pick up Lauren from her house on the way to diner. Our jaunt in Burger Week Lexington consisted of $5 sirloin burgers at Athenian Grill, an adorable shack of a restaurant, where we devoured our dinner and jumped to our next location: Kentucky Native Café. This place was a dream of dreams, a fairy-light oasis found in a parking lot of all places. We were visited by the resident cat as we drank our local brews, surrounded by gorgeous and lush greenery. In the morning, our suspicion that Lexington, KY is actually Pawnee, IN was confirmed. On the short and sweet walk to breakfast at Magee's, we got to spend some time with Darly, Lauren's across-the-street neighbor's miniature horse. Li'l Sebastian in every way, Darly greeted us with blank stares as she grazed, and Lauren regaled us with stories of her indoor-outdoor house-pet life. Mcgee's was a jewel in the middle of Lauren's neighborhood, the biscuit and egg lovers in us were satisfied, and our caffeine addiction was sated before we headed out for some bourbon trailing. 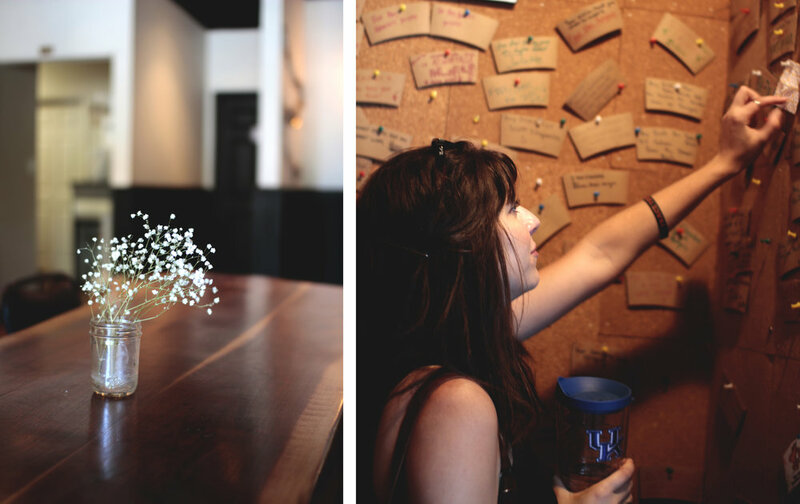 Magee's also hosts a map-wall where travelers post a bill or two from their recent or forth-coming travels. We added a little to the wall, checking to make sure the places we'd been were all represented. Our second stop of the day was Buffalo Trace Distillery, where our tour guide Brian (also a debate coach at the local university) introduced us to all things American Whiskey. We spent some time learning, some time tasting, and the whole time smiling. Buffalo Trace is one of the only distilleries in the country that operated during Prohibition, and has since been established as a National Historic Landmark. Visiting museums is great, but this was historic and delicious, so there's that. Filling the time in-between distilleries, we headed to the Chocolate Holler, where we wished we had more time. We downed a drinking chocolate flight in about ten minutes, maybe less, and read the sweet notes of the pay-it-forward wall where patrons had purchased future chocolates for their heroes, those they knew well, or strangers who happened to fit their requirements. At the Kentucky Ale Brewery-Distillery, we signed up for way more than we expected, learning about both sides of the business. One of the few brew-stilleries in the United States, the variety of products offered there was impressive, and whittling down the ones we wanted to try from thirty-two options to the four tastes we were allowed wasn't easy. To round out the day, we picked up Thai food on our way to the Berea Pinnacles, a series of hikes that provided a spectacular sunset view of the area. We had a lot of cloud cover, but what we didn't get in a bright sunset, we received in the cool breeze and a shady rest from the sunny day. We climbed some tight crags up to the summit, took a rest at the top and were thankful for headlamps on the way down, as the light escaped way quicker than any of us had expected. Hanging with these two has always been wonderful, and getting to see a little slice of life so different from my own was a treat. Meeting Lauren's friends, seeing her little home for the last four years and squeezing every ounce of time we had before she left the country for an international adventure of her own, these all made for one restful road trip. Mari and I met in Thailand almost three years ago. When she reached a high milestone this summer--one year in one home in one city--she called me to help her document the occasion. Her home, "The Shalom Home" is as delightful and welcoming as she is and it was a joy to be able to visualize it. Happy one year, Mari. Early this year I made a few friends who I found out were pretty partial to Austin. They talked about the concept of "Keep Austin Weird," they gushed about Barton Springs and the amazing food and music and outdoor jaunts. I'd been wanting to go to a new city in the states for a hot minute, so when the stars aligned and I had a couple reasons: I went. So a few days after my 27th birthday, Andrea watered the plants, Megan pulled into our driveway, and we all hopped in my car for a nice six hour drive to Arkansas, a little shake of Memphis, and another six hours to our Barton Springs Airbnb. The straw that I'd found to motivate the trip, was a show featuring Josh Garrels and Strahan at Emo's. I love live music, and I'm thankful I've seen a lot of it. I don't tear up at many shows, but this one was full of love and emotion and HOLY MOLY some great sounds. Also picked up a local brew: this Enneagram 9 chuckling the whole time. After the show we found food at Spider House, which had been recommended to us by no less than five friends prior to this trip. In the morning we headed to the brunch of our lives at Hillside Farmacy. If you know me at all you know I'm pretty particular about brunch, and this place didn't disappoint in any way shape or form. The space was heavenly, and the food was amazing as well, and not too filling, which was good considering we were about to fill the rest of our stomachs with cupcakes at Silos Baking Co., when we zipped on up to Waco since we'd missed in in our haste to get to Austin the day before. Upon our return we met up with a friend I'd met while working Fuge in Asia (why do I meet all my friends in Asia?? ), Caleb, and if there way anyone we needed to get up with to know where to eat, sip coffee and taste beer, it was him. Before figuring out where we wanted to eat dinner, we spent the late afternoon exploring the shops along South Congress Avenue, where I promptly forgot to take pictures, distracted by a million things (clothes, books, and all the cute stuff). We ate family style tapas at Sway, an incredibly modern Thai restaurant with a beautiful patio that almost made us forget how hot Austin is. Caleb took us to Lazarus Brewing afterward, and over a flight, we spent the better part of two hours discussing reformed theology, personality, and getting the real skinny on where to visit the next couple days. Early the next morning, Andrea and I walked through Zilker Park and headed to Rowing Dock on the Colorado for some SUPing. I was brand new to this, and as someone who's not really that balanced in yoga that's on a very solid floor, I was a little hesitant. Helpful that the boards are meant to balance and therefore help you out a little bit. I found this to be true. The hardest part for me ended up being the line of floating ducks outside the docks, probably took me a whole two minutes to get past those jokers. Truly taking a vacation vacation, we napped and napped and finally headed to Kerbey Lane for lunch with Hilary, a friend who I knew from Asia (surprised?). Felt like home being there, a gem of a breakfast spot in the midst of an unassuming strip mall. Reeling from pancakes and mimosas we headed to the library, which we'd heard was lovely and huge and as book-lovers we were all impressed, yes. Unable to borrow, we took the books we'd brought with us to Figure Eight for iced coffee, because non of us could dream of ordering a warm drink, thanks Austin. That afternoon we made reservations at Café No Sé, per Caleb's recommendation. It seems we stumbled upon so many of the visually lovely places thanks to his picks, and this place was no exception. Our food was pricey, but it was delicious, and the kind that was totally worth it. We played a very-well-loved game of Scrabble (the letters were rubbing off of all the tiles) at Blue Owl Brewing while hastily sampling sours in the last hour before closing. Megan and I are the sour lovers in our trio, but the night saw Andrea bringing home liquid souvenirs. As we headed out on Sunday, prepping for a full day of driving, we fueled up at Better Half, excited to hear from Caleb about the future plans for the space, delighted to try their amazing brunch menu (better order anything with a biscuit). Dreading thirteen hours on the road may have been the main reason we didn't want to leave, but I definitely think Austin hit the nail on the head when it comes to a proper vacation: exploring, rest, outdoors, food and drink. 14/10 would visit again. Only probably in the winter, though I'm not sure Austin is ever not hot.